The desire to achieve outweighs the negatives. I made the choice to do one post every few days rather than posting every day because it was getting a little bit repetitive. So here is what I have been up to and a little bit of information on my progress. Enjoy and I hope you do not find it too repetitive or tedious. __________________________________________________________________________________ 25th: After a restless night’s sleep I woke up at 12pm and laid in bed thinking about what to do with my day. After much pondering I sat up, turned my laptop on and uploaded some photos to Facebook (this surprisingly took me 1 hour to do; there were lots of photos and I had to add captions, dates and so on). Photos uploaded, captioned and tagged I made myself wake up by jumping into the shower. Feeling fresh and awake I proceeded to the kitchen at 1.30pm to do some university work. As I sat at the kitchen table I browsed through some web searches on research paradigms and decided to continue with the tasks set on the previous day (to read around research and to start thinking about what paradigm/methodology will underpin my research). I continued reading until 4pm when I stopped to make myself something to eat. Akin to most afternoons I made myself some toast along with a bowl of salad and a mug of mint hot chocolate. Sat at the table eating my food I became panicky and worried. Why? I honestly do not know; It is a sinking feeling that I get, it is like the books are drowning me and I cannot push myself out of them without being worried. Worried about what? The answer: misinterpreting the information, overcomplicating things and over reading. Whilst I ate I sat staring; Motor spoke to me and talked me around to thinking positively. With a more positive mind set I continued to read… I took a 15 minute break at 6pm…and by 8pm I was making myself poached egg and spaghetti rings on cheesy toast. Reflecting on the day, while I stood waiting for the egg to poach, I felt overly worked and fed up. I am running myself deep into the ground and not letting myself have a break. I cannot go one day without doing work and I think this is becoming detrimental to both my health and to my knowledge acquisition. After I had eaten I came to the conclusion that it was probably reasonable for me to do something unrelated to my research. Thus I opened my laptop and made a photo movie from the photos taken when I went to Rome with my partner; shockingly I was sat at my laptop doing this until 2am. I pulled my out-of-focused eyes away from the screen, packed my books, notepad, pens and laptop away, and proceeded to move myself to my bedroom where I laid in bed watching TV until 4am. I thought about the day I had had while I laid in bed trying to sleep and started to question my ability to do research. Becoming anxious I sat up and started to cry. I CANNOT DO THIS; I AM NOT GOOD ENOUGH; I AM RUBBISH; I DO NOT EVEN KNOW IF I AM READING THE RIGHT THING; I HAVE BEEN DOING THE SAME THING FOR AGES NOW AND I AM GETTING NO WHERE; I CANNOT UNDERSTAND ANYTHING; NOTHING I HAVE DONE HAS HELPED ME SO FAR; I NEED ADVICE; I WANT TO QUIT; I DO NOT WANT TO DO THIS; MY IDEA IS RUBBISH; I DO NOT KNOW WHAT RESEARCH METHODOLOGY TO USE; I DO NOT SEE A POSITIVE OUTCOME. 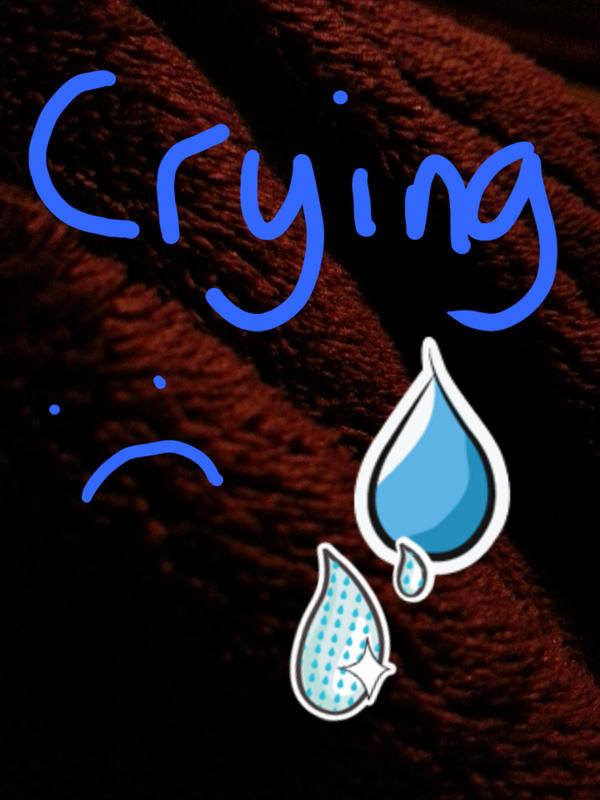 By 4.30pm I had stopped crying, I had wiped away my tears and I was laid back in bed with the duvet pulled over me. I ended the day in a devastating state. 26th: I was meant to wake up at 8am to make sure I wasn’t late for my hairdresser’s appointment but I slept through my alarms and work up at 10am. I jumped out of bed and rushed to the shower and by 10.15am I was stood waiting for the bus feeling a little bit annoyed with myself for not waking up when my alarms rang. I wanted to get up earlier to allow time to do some last minute holiday shopping before I went for my hair cutting (I knew that I wouldn’t have time after because I was going to meet my university friends to go for lunch and to the cinema). The bus arrived at the town centre at 10.45am giving me just over half an hour to do my shopping. After rushing around the shops I arrived at the hairdressers at 11.15am (I managed to buy everything on my shopping list, despite the groceries)…45 minutes passed and by 12pm I was speedily making my way to Morrison’s to purchase some groceries. Groceries purchased I swiftly went to the train station, caught the train and made the journey to the cinema. As I stood outside the cinema, waiting for my friends to arrive, an overpowering feeling of guilt was present because I was thinking about the fact that I was going to take most of the day off from doing any university work. I told myself to stop being silly and to enjoy spending some time with my friends. By 5.30pm my friends and I had had some lunch and watched the film ‘the expendables 3’. It was pleasant to have had some time away from the realms of university work, and I had thoroughly enjoyed myself, but by the time I arrived home at 7pm I was sat at the kitchen table doing some university work. Yes, you guessed it, I cannot allow myself to have a day off from doing any work, especially when I am going on holiday for two weeks at the end of the week. 2 hours passed by and I stopped reading at 9pm to make myself something to eat. I felt sick and didn’t want to eat anything but I knew I had to, so I had some salad, toast and a cup of tea, followed by a bowl of fruit. From 10pm onwards I did some reading at a leisurely pace and at midnight I made the move to my bedroom to watch TV. Despite being tired and nauseated I could not get to sleep; I tossed and turned in my bed from 1am for what seemed like hours. At 2am I gave in to the restlessness I sat myself up, grabbed some books and proceeded to read random chapters. I finally put an end to the day at 5am when I drifted off to sleep whilst reading. 27th: My alarm rang at 8.30am; I pressed the snooze button and fell back to sleep for another hour and half. Instead of my usual ‘shower and then get dressed’ routine I jumped out of bed, brushed my teeth, had a quick wash, got dressed and by 10.15am I was on the bus to town. I had to go to town again to do some more shopping, seen as I forgot to buy some yoghurts, and to take some books back to university; I also had to go back to the hairdressers because she did not cut my fringe to how I like it. After returning the books and purchasing an A3 notepad, an expandable file thing and some yoghurts I made my way to the hairdressers; as I entered the building to the hairdressers I became nervous about going in and having to say that I was not 100% happy with how she had cut it. I even considered turning around but deep down I knew that I would have regretted that decision. There was no need for me to be nervous because she was happy to sort it out for me. Fringe sorted I headed home at about midday. Traffic, Traffic, Traffic… the bus journey felt like a lifetime but at least I had some entertainment in the form of my radio and a newspaper. I arrived home at 1pm and jumped into the shower to wash my hair before doing any university work. The clock read 2pm when I was in the kitchen making myself some lunch (you guessed it… I followed my usual lunch ritual by making some toast, salad and a hot chocolate) and by 2.30pm, after initial worry, I had started doing some university work with the hope that I would do the task set for the day in a competent, successful and joyful manner. 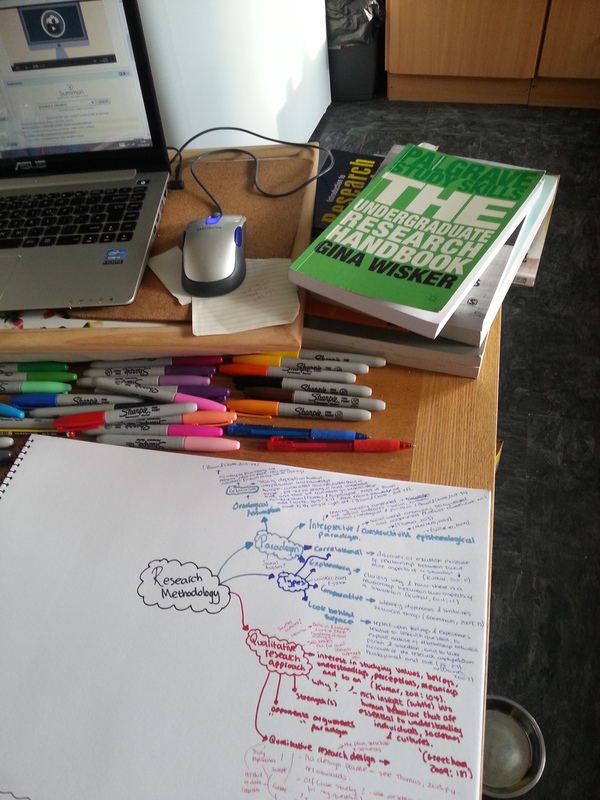 Task for the day: to create a mind map outlining my research methodology identifying sections such as the paradigm, research design, methods and data collection and analysis. ….time passed extremely quickly; I was working happily and before I knew it, it was 6pm. Pens down and kettle on I stood at the kitchen table looking down at the work I had done so far; it did not look like I had done much work but I felt pleased with it regardless (my research paradigm and design had been identified, and I remember thinking to myself ‘I finally understand what ontology and epistemology is; this mind map is giving my research a direction… Fingers crossed it is all ok’). After having a mug of tea and another slice of toast I continued with the mind map in high spirits and in an extremely motivated manner. 8pm called for me to stop working and I proceeded to make myself my evening meal. After deliberating what to cook I concluded on having a baguette with cheese and a salad (it was a huge salad with mixed lettuce leafs, cucumber, cherry tomatoes, raw beetroot, carrot, butternut squash and lots of cheese). As I ate I reflected on the work that I had done and I am pleased to tell you that all my thoughts were positive. I had managed to complete the basic mind map and I was pleasantly surprised with how helpful it was to do. I made the choice to do some reading on research ethics and on doing a research proposal when I had finished my evening meal (the proposal, as well as the initial search of the literature, is the next thing I have to start to do). Reading was suspended at 11.30pm and by midnight I was upstairs watching TV and painting my nails. 2 hours later I attempted to sleep but failed. I do not know what is wrong with me as of late; I cannot sleep when I try to and my mind never seems to switch of from the university work. I opened a book and read for an hour until I felt my eyes closing. I ended the day feeling content: I had managed to complete the task set and I had given some form of direction to my research methodology. Today: I’m not going to bore you with my usual morning routine; to sum up I woke up at 11am, got a shower and so on and then proceeded with the day’s tasks. With all the tasks that needed to be finalised before I go on holiday completed I decided to take it easy by setting myself the following tasks: Task 1, clean my bedroom and change my bedding; Task 2, pack everything that I can for my holiday; Task 3, iron any clothes that need ironing; and Task 4, continue to read about ‘doing research’ looking particularly at sampling and ethics. With the first three tasks finished by 3pm, I took myself to the kitchen to do some university work; before I began I had to make myself some food and as I did so I felt hazy and lethargic, and was not really feeling in the mood to do any work. Surprisingly by the time I had finished my food I was more motivated; I reminded myself that I had done the tasks that needed doing before I go on holiday and so there was no need to stress or worry about the work I did, or did not get done by the end of the day. I read at a leisurely pace until 8pm (stopping at 6pm to have a hot chocolate and a slice of toast, and to finish packing for my holiday). After a two-hour break I continued to do some reading until I made the choice to go up to my bedroom to watch a film at 11pm. Today was not very productive on the university work front and I do not feel like I have used my last day before I go on holiday wisely. I even attempted to find some more secondary data relating to my research topic but that was not very successful and I was left feeling downbeat for a short period of time. As you can see I have made progress and managed to complete all the tasks that I had set to do before I go on holiday. I have made myself a mind map for my research methodology and I have finally concluded on the paradigm that will underpin my research (an Interpretive/constructivist epistemological paradigm). My emotions have been up and down, I have had moments of panic, I have questioned by ability and I have even wanted to give up. But I have overcome the negatives and I have finished the week feeling content and ready for the next stages of my dissertation journey. The desire to achieve outweighs the negatives. I am likely to have strong feelings of guilt while I am on holiday (due to the fact that I will not be doing any university work) but I will try my best to manage with this; I know deep down that I do need to have this break before I go back to university, and you never know it might revitalise me and make me even more determined and motivated. 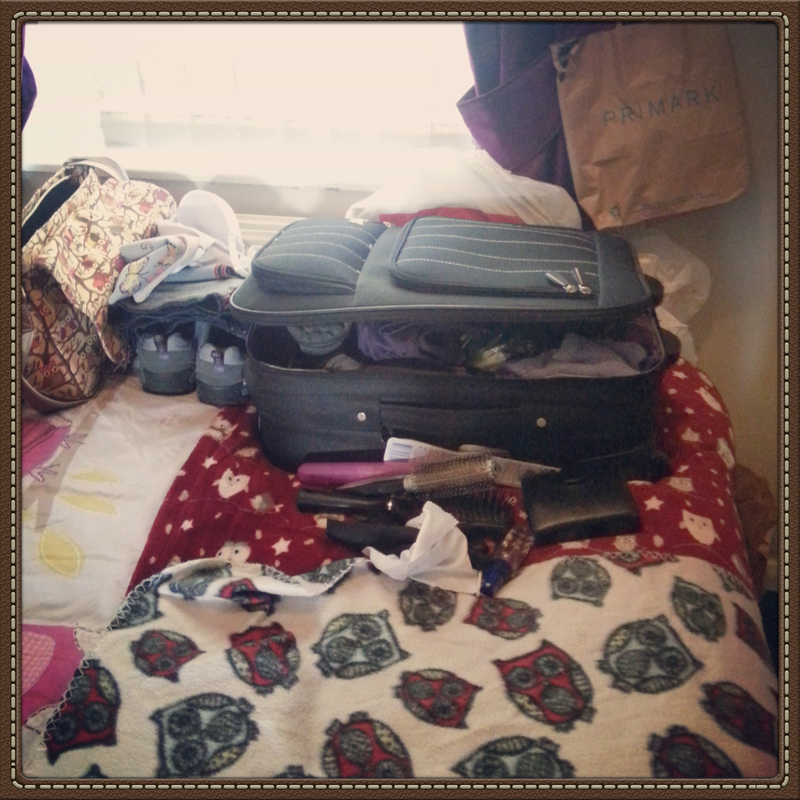 All packed and ready to go on holiday…EXCITED! The overwhelming feeling of guilt fails to let me have a complete day free from university work. After a restless night I wake up at 12pm (late I know but I didn’t actually get to sleep until 5am). I lie in bed gazing up at the roof thinking about the previous two days and the fact that I have not really done any work (this is not necessarily a bad thing because I cannot be doing university work all of the time. For some reason though I feel guilty when I have a day not doing any work. I shouldn’t but I do). An hour passes by and at quarter past one I decide that it is time to get myself up and out of bed. I push the duvet away from me, force myself to get out of bed and scrape my tired body to the bathroom. Leaning on the wall while I wait for the shower to warm up I start to consider what it is I should do today. I set myself 2 main tasks: the first, similar to what I have set myself over the past week, is to read around research methodology, paradigms, ethics and validity/reliability; the second is to decide on what paradigm/ framework will underpin my research. Tasks set I proceed to take a shower and as I do so I try to wake myself up by humming and jigging about. I finish in the shower and follow by getting dressed into something comfortable. Ten minutes later: I have made the move to the kitchen and I am working on a task, unrelated to my university work, for my partner which involves editing images. Day 1: Before going to my partner’s house I went into university to do some reading. Staying for 1 hour I managed to read and make notes on generalizability and transferability. Once at my partner’s house I continued to do some university work but I took it at a very steady pace; I did a few more hours of reading and I searched the web for more sources on ‘doing research’ (I purchased a book titled ‘How to do your research project’ by Gary Thomas (it seems quite good)). Throughout the day my emotions were up and down like a rollercoaster I was not in a great mood and I felt very overwhelmed by the whole dissertation task; my thoughts were very much negative and motivation lacked. I proceeded to procrastinate from about 6pm until tea and then again after tea. This made me feel even worse because I was wasting valuable time doing absolutely nothing when I could have been trying to get my head around some of the confusing aspects of research. Day 2: I was ill and didn’t feel like doing anything at all so I spent the day with my partner planning out the things we will do when we go on holiday (I also helped him with some of his work tasks (he works from home)). 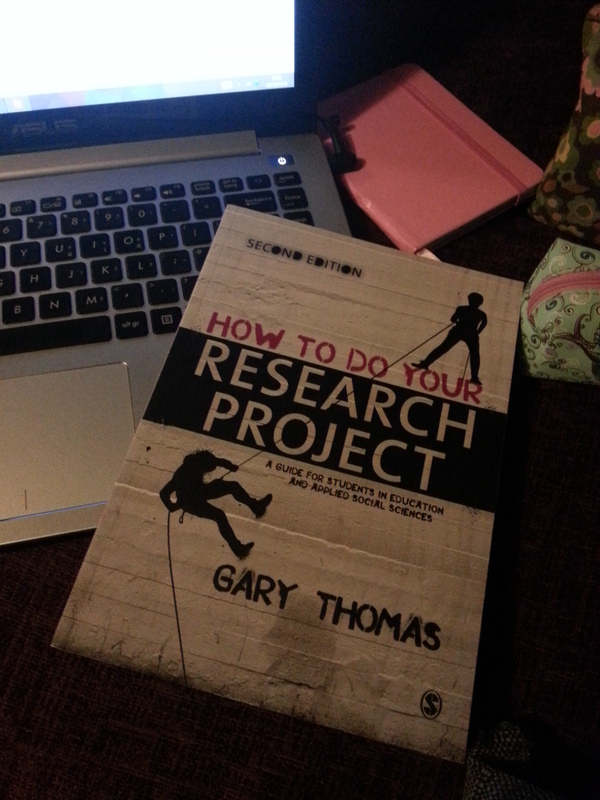 I ended the day back at home feeling haunted by the fact that I had not done any university work and I could not resist having a read over one of the chapters in my new ‘How to do your research project’ book that arrived earlier in the day. So, the day was almost work free but my guilt was too overpowering and I had to do some reading before I went to bed (I need to learn to not feel guilty when I have had some time away from the work; I cannot expect myself to do it nearly all day every day). Hair dyed, washed and dried I make the move back to the kitchen table to make a start on the tasks set earlier. I pull my head out of the book that I am reading and look at the clock…it reads 8pm. This shocks me as I have, in my opinion, not done much in the vast amount of time that I have been reading and note making. Surely I can be happy with what I have done though, can I not? This is a question I ask myself but I do not give myself a rational response, I become anxious and stressed. I have read a couple of differing chapters from one book titled ‘Research methodology, a step-by-step guide for beginners’… I tell myself that this is not substantial. Motor interrupts and makes me aware that I should be happy; I have made notes on varying aspects of research and this will all come in use when I start to do my research proposal and dissertation. I sigh a breath of relief and give myself a virtual slap into reality; it is better to read a smaller amount and understand it then it is to read a lot and end the day confused, isn’t it? I pull myself away from the table at 8.15pm to make myself some food. Exploring the fridge and the cupboards I decide to make myself vegetables in a stir-fry sauce with chicken. As I prepare the swede I consider how I can achieve the tasks I set myself today and the conclusion I come up with is: ensuring successful completion of both task is impossible so the best solution is to continue with them tomorrow. I will continue with task one after I have eaten and hopefully it will be near completion when I go to bed. Solution formed I continue with making my evening meal. 10pm- Food eaten, plates cleaned and a cup of tea made I take myself to the living room to continue with task one. A couple of chapters read I stop at 11.30pm. I am tired and I do not feel very well but I have had a good day of reading. I will go to bed satisfied with the progress I am making. 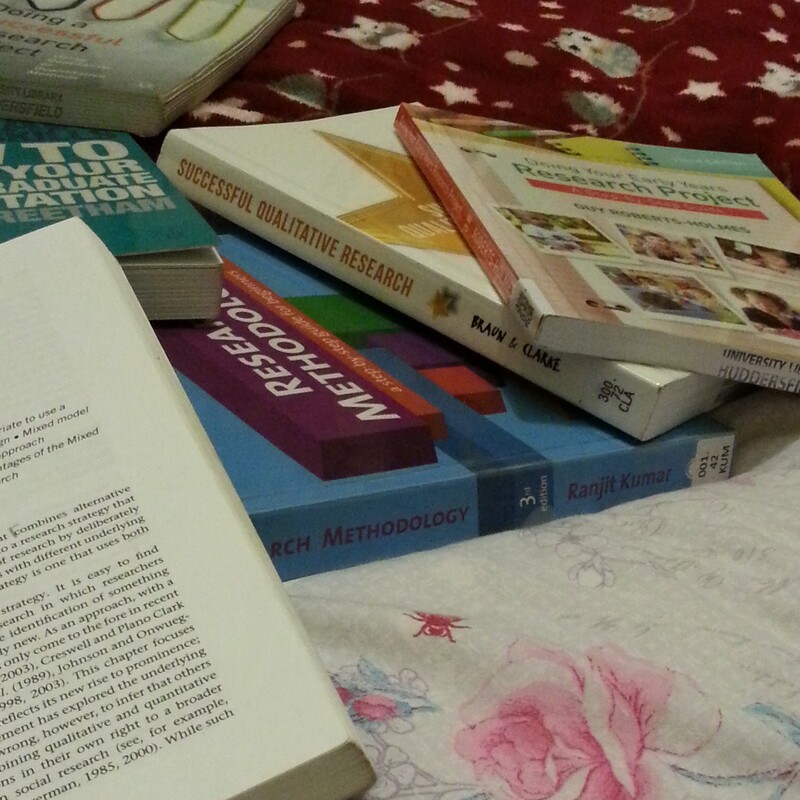 A lot of my time is being spent reading around research methods/methodology but I am hoping it will be worth it; it will help me with choosing my research method(s)/ methodology and ultimately with the whole dissertation process. Tomorrow should see the completion of the tasks that I set myself today, or at least the completion of task one. Task two could take me some time because I really want to be positive with the paradigm/ framework that will underpin my research. At 11.45 I make the move up to my bedroom; before I go to sleep I am going to do some more image editing (for my partner) and then I might watch a film to help take my mind of university work. I go to bed hoping for a successful, productive and stress free day tomorrow. Oh and fingers crossed I motivate myself to get out of bed earlier! I do not know if I am going to continue to post everyday because all my posts seem repetitive and I am sure this is getting annoying for my readers. What do you think? Would you, my readers, like me to continue to post daily (when I can) or would you like less regular and repetitive posts telling you about my progress? Motivation overrules exhaution; I end the day feeling content. It is 9am when I wake up, after about 5 hours of sleep, but I cannot scrape myself out of bed. I lie tossing and turning, thinking about the day ahead and as I do this my body slowly fades into a deep sleep. Waking up at 1pm I push myself out of bed determined to make the most out of my day. I proceed to the shower, hoping that it will revitalise me. Standing in the shower, humming, I think about what task to set myself today. Even though I am determined to make the most of it I am still feeling under the weather and this could, again, prohibited progress. I finish in the shower and drag my achy body to my bedroom to get dressed. Similarly to the previous two days my eyes are wanting to sleep, my body is exhausted and my head is in a painful haze; but the difference today is the fact that I do have some slight motivation and dedication running through me. I dress, gather my books, notepads, laptop and pens, and make the journey to the kitchen table. Entering the kitchen I decide to make myself some lunch. I stand by the fridge contemplating what to make for at least ten minutes. I pop two slices of bread into the toaster and grab some random salad items…lunch made, I move to the table and begin to eat. Before I know it the time reads 2.30pm and I have not even started doing any work yet. It is looking like today is not going to be a successful one yet again (I do not plan to do any work over the next couple of days because I want to spend some quality time with the people I love the most, so I need to make some sort of progress today). I stand up, walk to the kitchen side, flick the kettle on and stare out of the window while I wait for it to boil. As I stare I think about how I can make today successful but this only results in me becoming stressed and annoyed. Motor tells me to stop and think about the day rationally. I hear the kettle shaking (a sign that it has finished boiling), I snap myself out of the stare and make a hot chocolate (mint flavour today). Back at the kitchen table, with my scrummy hot chocolate, I open my notepad to a clean page, choose a book to make notes from and start working on today’s task which is to continue to read around, and make notes on, research methodologies looking particularly at qualitative research methods, paradigm and ontological and epistemological assumptions (I do not know if this is really necessary for my level of study but I want to understand it for future reference). 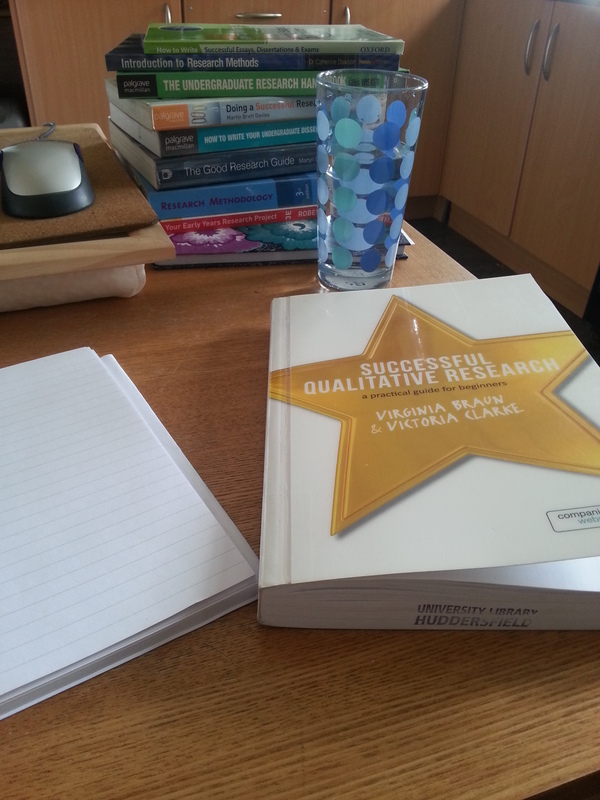 Lifting my head up from the ‘successful qualitative research’ book I notice that it is nearly 6pm. I cannot believe I have managed to stay focussed; a smile spreads across my face as I realise that I am achieving something despite feeling tired and poorly. This joyful feeling is much better than the de-motivated, un-dedicated and stressed mood that I was in yesterday; as I continue with reading I cross my fingers hoping that this feeling does not fade. I hope that you will be as pleased as I am with the fact that I now slightly understand ontological and epistemological assumptions (I added the word slightly because I am not yet 100% confident with it but I am not anxious or stressed about it; I plan to read a different book that outlines the same topic later). 7.30pm- I am tired and my head is pounding but I am still feeling positive towards todays task. So far I have re-read the ‘paradigm’ and ‘ontological and epistemological assumptions’ sections and read, and made notes on, the ‘focus groups’ and ‘qualitative surveys’ sections. This has surprisingly taken me quite a lot of time. I just hope I have actually made sense of the information and that it will come in use when I start doing my research. I do know that it will help me with deciding on what data collection techniques to use. At the moment I am considering doing mixed methods research (where I will use both qualitative and quantitative research techniques) for my dissertation but the questions I keep asking myself are: Will this be too much? Do I have the abilities and skills to do mixed method research? Do I have the resources available to me? Do both methods link to my research question(s)? These will all have to be answered in the upcoming future but for now I believe that the best thing for me to do is read around ‘mixed method research’, ‘qualitative research’ and ‘quantitative research’. Other questions that I need answering are: How much detail do I have to go into in my research methodology section for my level of study? What information do I put into my methodology section in my research proposal? And, how do I get to my research population? I am sure answers to these will be given on my return to university but I am very eager to a) get started; b) get everything cleared up in my mind; and c) know what is expected for both the research proposal and dissertation modules. Anyway…pointless talk over, it is time I carried on with this reading. 8pm calls for me to stop for a couple of hours and I leave the table to make myself something to eat. I ponder at the fridge for twenty minutes, being indecisive. I opt for honey-soy salmon and salad. Food eaten, plates cleaned and a cup of tea made I continue to read. By the time I stop reading it is 12.30am; I cannot believe how fast the past 3 hours has gone. I have made some more progress and I have also found some journal articles to read on qualitative research which I think will be useful. I end the day feeling exhausted and poorly but I am happy; I go to bed feeling content. Exhaustion lingers and progress is prohibited. This was meant to be uploaded yesterday so apologies for the delay. I have only just realised that I forgot to press publish. I have not changed the ‘todays’ to ‘yesterdays’ so I also apologise for that too. Today starts at 7.30am when my alarm forces me to wake up. I have only had three and a half hours sleep which I know will not be enough for me to function normally. Proceeding to the shower I notice that I am in a half awake state: my eyes are tightly closed, my body feels like it is dragging around a heavy weight (by this I mean it aches considerably), and my head feels hazy. There is no change in my state by the time I finish in the shower and I have to scrape myself back to my bedroom to get dressed. In total it takes me two and a half hours to get ready and prepare myself for the day ahead. I do not predict great things due to the fact that motivation, dedication and the ability to function are low. Despite the fact that I would much prefer to throw myself back under my duvet, 9am calls for me to set off to University (I have planned to go in for an hour this morning before I go to my partner’s house). During the bus journey my stomach growls at me asking for food so I decide that it is wise to make a detour to Morrison’s. Making this detour takes me half an hour in total and I purchase a Muller Rice along with other various groceries. Arriving at the university campus at 10.15am I lay out my textbooks and continue to read around and make notes on research methodologies. I am fighting a battle with myself and I can feel my body shutting down as I work. Pushing through the exhaustion an hour passes surprisingly quickly and at 11.20am I pack away my belongings. The journey to my partner’s house begins. I do not have much to report as the day progresses because the exhaustion is overwhelming and I am struggling to concentrate. Lunch has passed and I have had a lie down but now I must get my head around doing some work. I make a cup of tea and prepare my work station. It is now 4pm; motor wakes up to tell me to get my act together and assures me that I do not have to do lots of work as today was/is meant to be an easy day. Textbooks laid out, notepad open at a fresh sheet of paper and pens at the ready I attempt to make some progress with reading and note making. 3 hours passes by and the clock reaches 7pm. If I am going to be honest with you I have taken it far too easily and little progress has been made. I have been trying to understand qualitative research paradigm and its varying underpinning ontological and epistemological assumptions…extremely confusing. My head hurts, my body is half asleep and I am ready for something to eat; luckily my partner’s dad has nearly finished making pizzas (ham and pineapple for me). I stop working and proceed to the kitchen to set the table and clean up some of the dishes. Food finished, plates cleaned and a hot drink made, I head back upstairs. My partner has to get back to work (he works from home) so I am left to find something to do until we settle down to watch a film. I feel as exhausted as I did earlier and I am not up to doing any reading. I sit at the desk in a solemn state for half an hour. My partner tells me to perk up a little and makes me aware that he won’t be working too late, which I am happy to hear as I could do with an early night. Despite feeling rather gloomy I pick up the ‘successful qualitative research’ book and begin to read the chapter surrounding the confusing topic I mentioned previously. As I read my head becomes hazy and the differing information is getting muddled up in my mind; I cannot cope with the confusion and I become distressed. Why am I finding it so hard to understand the topic I am reading about? The answer: because I am utterly exhausted and feeling slightly under the weather. When 11pm arrives my partner and I decide to put an end to the work; we grab a snack and sit down to watch a film. Today exhaustion lingered and progress was prohibited. I do not think I will post a new blog entry for today because there is very little to report. It was very much the same as yesterday in terms of progress. I have been ill all day and I have only managed to do a couple of hours of reading. Motivation lacked, I was in a dull mood, I could not concentrate fully and I didn’t note my progress, thoughts and actions as the day progressed. I go to bed hoping for a better day tomorrow. A day half spent traveling; a day that ends with me feeling both satisfied and slightly disheartened. My alarm rings at 7.30am. I press the snooze button, pull the duvet over my head and lay in bed postponing movement. My alarm rings again alerting me that it is time to scrape myself out of bed. I push the duvet away from me and drag my tired, achy body out of my bed and into the bathroom. I switch on the shower and lean against the bathroom wall until the water reaches a desirable temperature. Desirable temperature reached I throw myself under the shower and sing gently as I was away the tiredness (singing sentences not known by any other member of the human population). Ten minutes or so later I am dressed and ready for the day ahead. By 8.40am I am making the journey to University which is likely to take me well over an hour. I have never travelled to the main campus before so I might get lost along the way (the university I attend has a smaller campus based in the town that I live in and until now I have not felt the need to travel to the main campus). Why am I making this journey today? The answer: to use the vast amount of textbooks they have on doing research, to look at paper journals on my chosen dissertation topic and to look at previous completed dissertations. I arrive at the town centre at 9am; I have missed the train that I needed to catch and the next direct train is not until 10:0am so I decide to go to Wilkinson’s and WHSmiths to buy some stationary. I purchase 2 notepads (one A4 and one A5), some Paper Mate® pens, a pencil case and some Sharpie® fine point colourful permanent markers. As I walk to the train station I deliberate what it is I aim to achieve by the end of the day. I know that I want to look at the materials and resources available at the university but I do not know what exactly it is I am wanting to achieve from doing this. I ponder as I sit in the train station. The train arrives at 10:01am and the main part of the journey begins. Sitting at a seat with a table, I open my laptop and read some of the pdfs I have on research methods but this starts to give me a headache. I stop and think about what tasks to set myself today. The tasks I set are as follows: Task 1: find resources on completing research and make notes on methodology; Task 2: look at previous dissertations and note what kind of things are included (i.e. the sections and order). My tiredness makes me think about the day ahead irrationally and I doubt my ability to make good progress with these today. Motor wakes up and speaks, ‘Come on, there is no need for that. You have motivated yourself to get up and make this journey so now motivate yourself to make the most of your time at the university. You can do this, stop doubting yourself and put that smile on your face’. The gloomy look is removed from my face as I smile. Arriving at the city at 10:50am I feel overwhelmed and lost. I do not have any idea where I have to go and I am alone. Surely I can make my way to the university site without any issues? Grabbing my phone I google how to get to the university and begin to follow the directions. I will make it to the university without getting lost! As I begin the journey I come across a free city bus which luckily for me goes to the University. My initial worry of getting lost disappears. Journey complete I enter the University library at 11.10am. Looking around I notice how big the library is in comparison to the one at the campus I attend. This scares me and I panic. How am I going to find anything in here? It is too large, it is a maze. Motor speaks: “Stop with this irrational behaviour! It is not a maze and you are not going to have any problem finding the resources. Just use the library web catalogue to direct you to the resources you are looking for. You will find it is quite easy when you get started. Good luck and be joyful!’ I listen and follow the instruction to use the web catalogue. Locations of books noted I make the journey to collect them. Collecting the books I want to explore takes me 50 minutes. Sitting down at the table in the quit study area I set myself the task of picking out and noting down the relevant information, reminding myself to make a note of the reference. Textbooks, notepads, sticky labels (to note references) and the varying pens laid out in front of me I begin to complete task one. As time passes I realise that I need to make an enquiry into whether or not the library keep copies of undergraduate dissertations before the library staff leave. At 1.30pm I stop and make my way to the help desk. Arriving at the desk I notice two women manning the desk who seem to have little knowledge on what is or what is not available (this could be due to the fact that the library is undergoing a refurbishment). I am called forward and I make my enquiry. My initial judgment is eliminated as the woman tries her upright best to help me; she advices me to look at textbooks on dissertation/ research proposal planning and writing as, after much exploration of the online web catalogue, she cannot direct me to any undergraduate dissertations. The fact that they do not keep any copies of undergraduate dissertations leaves me baffled as I am 100% certain I was told by one of my old lecturers that copies are kept at the main campus library. I leave the desk half satisfied and return to my area of study. Work on task 1 continues. I stop task 1 at 4pm in order to begin the journey home. This early end is due to the fact that the last free city bus is at 4.30pm and I need to make a visit to the self-service machine to borrow some book before then. The journey begins when I have packed up all my belongings and returned some books to the shelves. Arriving at the train station at 4.40pm I notice that I have 35 minutes to wait until my next train home. I could make use of the 35 minutes by doing some reading or I could procrastinate. Procrastination seems like the best choice but I know that I should read something. Decisions, decisions… I choose to do the latter and before I know it my train home arrives. A wiser choice is made by my, more determined, self as I make the journey home. The journey time allows for me to read around qualitative research methods which, believe it or not, I have been doing all day. Reading the book proves difficult; in some sense I ignore the information because I do not grasp a substantial understanding of what the author is telling me. I put this down to the mere fact that I have several things stopping me from internalising the information: 1- surrounding noise, 2- my inner motivator is not present, 3- I am feeling lethargic, 4- I do not have the correct work station set up in front of me, and 5- I cannot make any notes, which for me, to allow for some remembrance of the information, is a necessity. I do not know what happens but 20 minutes into the journey motor come alive; I keep reading the chapter ‘carrying out interviews’ despite the fact that I am probably not retaining any of the information. That’s ok though, surely it is better to at least attempt to understand the information than it is to sit here staring out of the window for half an hour. After a long and boring journey I arrive home at 7pm. I drag myself upstairs and get changed into something comfortable. At 7.30pm I decide to make myself something to eat. One and a half hours later I am leaned against the fridge waiting for the kettle to boil (I have eaten and washed up; today I made myself a tuna and cheese melt with soup- Yum!). As I stand there staring at the kettle I think about what I have actually achieved so far today. I can tell you one thing I am still none the clearer on what exactly it is I need to know about research methodologies for undergraduate level research. All I can tell myself to do is read and make notes on the topic but is this the best thing to do? I honestly do not know but I will carry on with it and hopefully doing this reading will improve my knowledge on research and research methods. My reflection on the day so far has made me acknowledge the fact that task 2 was impossible to complete; to stop me from becoming upset about the former Motor assures me that it was through no fault of my own and that I did at least attempt to find an example to look at. The sound of the kettle completing its boil snaps me out of my reflective daze and I make myself a hot chocolate. I take my hot chocolate into the living room and make myself comfortable on the sofa. 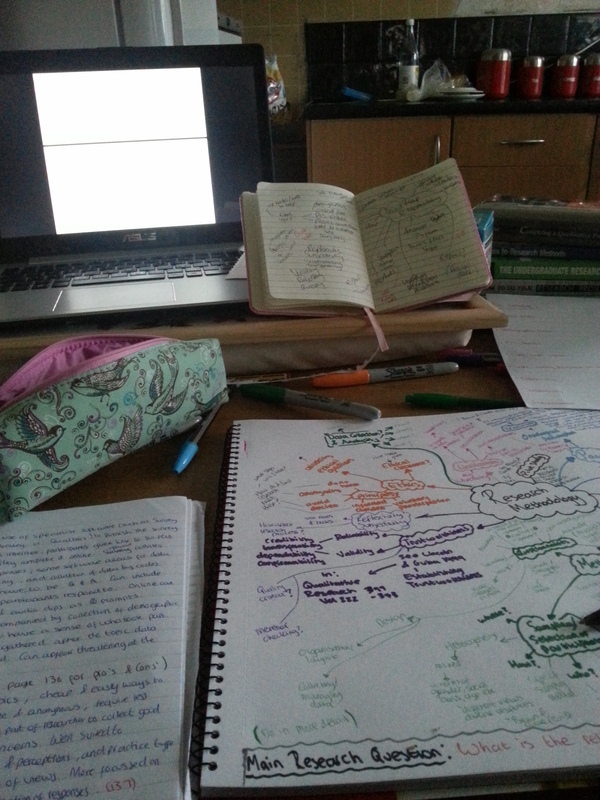 Notepad open, pens at the ready and research textbooks spread out I continue reading around research methodologies. 11pm calls for me to stop working. It has been a very long day and I it ends with me feeling satisfied with the reading that I have done but disheartened at the fact that I was not able to look at any undergraduate dissertations; Motor tells me not to dwell on the matter. By 11.30pm I am upstairs. I want to do some more academic reading but Motor shouts at me: ‘Stop! Do not overwork yourself, you can come back to it another day. You have done plenty’. I end the evening by switching on my TV to watch a film. Today has been a day half spent traveling; a day that ends with me feeling both satisfied and slightly disheartened. A day fighting a lost battle with my emotions. Motivation lacks today. I do not feel like doing any work when I wake up and I waste the majority of my morning procrastinating. As time passes I begin to think about the time I am wasting and Motor tells me ‘go and get a shower, freshen yourself up and do some work, even if it is only a small amount, at least it is something towards your dissertation’. I respond by dragging my sorrow self to the shower. Phone call over I make the decision to move downstairs to the kitchen table. It is 4.30pm by the time I am sat with my laptop open ready to set myself today’s task. I deliberate what to do and come to the conclusion that I am not up to doing a lot of work today. My mind is not 100% committed and I know that I will not produce work that is of quality when I feel the way I do right now. Who knows, I might feel more energised and dedicated later but for now I am not going to overwhelm myself with heaps of work. I set myself one main task: think about what research methods are to be used to complete project, in doing this weigh up the pro’s and con’s for all methods (make a note of these). To start I decide to browse the resources available to me on research methods and methodology to give myself a better understanding. I lift my head away from the laptop and as I look across the kitchen I catch a glimpse of the hot chocolate pouch sat on the worktop. I pull myself out of my chair, walk over to the kettle, flick the switch and pour the hot chocolate powder into my favourite owl mug. As I wait for the kettle to do its job I walk over to the radio and tune it into the station that I like to listen to while I work; I also pop a slice of bread into the toaster. 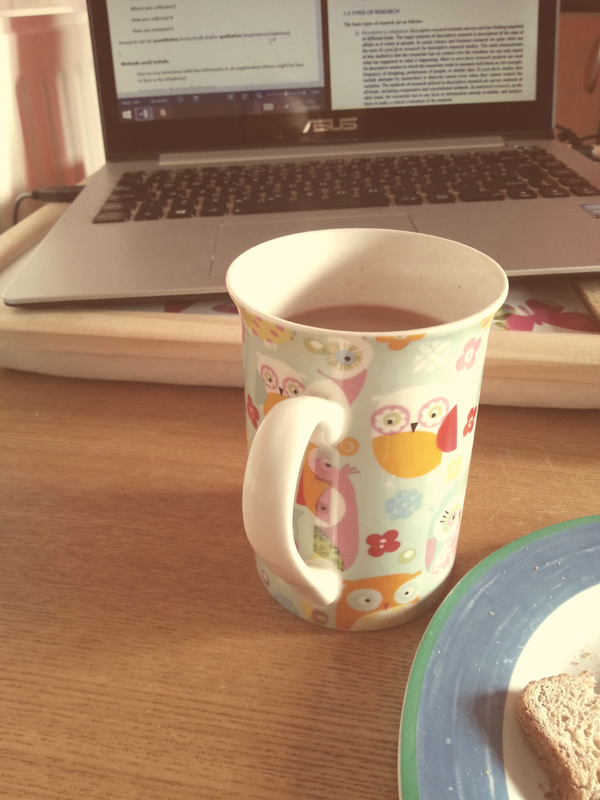 Hot chocolate and toast made I sit back at the table with a word document open on my laptop. I also place my notepad open to a blank sheet and my Berol® pens to the right hand side of me. Textbooks, web searches and pdfs at the ready, work begins. Time for a hot chocolate! I find that I have not completed much work by 6pm but this does not deteriorate me from continuing with the task at hand. I look at the page in front of me and notice that I have created a brainstorm stating key facts about research and what research methodology is, along with a list of primary research methods that can be used. I have a cloud over my head today and everything seems like a bit of a blur in my mind; I cannot get to grips with what it is I am wanting to achieve by the end of the day and I do not feel committed to the task at hand. I feel saddened but I continue regardless. By 7.15pm I have not made much more progress. I have only noted information regarding questionnaires and the advantages and disadvantages of using them. Why is it taking me so long to get this task done? The answer: because I am not fully committed to doing it, I am finding that it is boring and I am tired. I leave the kitchen table and walk upstairs. I lie down on my bed and think about how I could make this task more interesting. I feel myself drifting off but Motor shouts at me ‘Do not nap! It will make you feel worse and you will not make any more progress today. You will go into a mood and this will ruin the rest of your evening. Wake yourself up. Have 5 minutes away from the laptop but do not go to sleep’. In response I walk downstairs glumly and sit on the sofa. 5 minutes later, I move myself to the kitchen. My eyes feel heavy and I do not feel able to do this work but I must continue. I am fighting a hard battle. The clock reaches 8.15pm and I make the choice to stop to make some food. As I progress to make food I feel angered at the little progress I have made so far today and I feel myself becoming teary. Why am I getting like this? This is me being irrational. It is ok to have days like this isn’t it? Motor answers, ‘Yes, you can have days where you take it easy and do less; you will have days where you feel like you are battling against yourself, and you will overcome those days. It is all part of the journey’. I stop myself from becoming an emotional wreck by telling myself to be rational. The fact of the matter is I can always come back to this after I have eaten. The day has not ended yet and even if I do not finish this task today I can come back to it when I feel more willing and able to do so. I knock the sadness out of me as I make something to eat. At 9.30pm I finish eating and go to the kitchen to clean my plates. As I do this Motor stands by my side making me aware that I can complete the task set today and that I will feel content when I have finished. I listen and relocate my, more joyful, self to the living room. As you may have guessed I am slightly more positive and ready to complete the task set today. I open my notepad up to the pre-prepared pages and challenge myself to finish identifying the pros and cons of all the possible primary research methods. With Motors reassurance along the way I complete the task by 11.30pm. I sit and look through the work I have completed; there are 6 pages of notes on the varying research methods identifying the pros and cons of each. I can tell you one thing: that task was a long, dull and boring one but one that will come in use when I decide on my research methodology. Today has shown me that at times through this dissertation journey I will come across difficulties, boring tasks and times of sheer dismay. But surely overcoming these through pure dedication and commitment will only lead to success? I close all my web searches, pdfs, textbooks and notepad and put an end to today. As I go to bed I feel glum and reflect on the day I have had. Motor assures me that I have made progress and tells me that I should not feel so downbeat about the day I have had. I give motor a half-hearted smile and go to bed. A mind-boggling day creating a Gantt Chart; My dissertation journey has direction. Today I wake feeling very much under the weather but Motor kicks me into action as I stroll to the shower. As I shower I think about the task that lay ahead: Task 1: you guessed it (if you have read my previous blog entries), clean the kitchen and living room because a tidy work area is a tidy mind; Task 2: make a list of all the steps involved during the research process and the writing up of the dissertation; Task 3: create a Gantt chart (this could take me a while because I am using excel conditional formatting for the first time ever); Task 4 (if I have time): think about what methods are to be used to complete research project, in doing this weigh up the pro’s and con’s for all methods (make a note of these). Thinking about all these tasks makes me feel overwhelmed, a tear comes to my eye. Motor helps me control my stress levels by telling me that, in completing these tasks, I will feel more ready and able to progress to the next stages of the research process. My emotions are under control by the time I finish in the shower. Walking downstairs I feel Motor sat on my shoulders whispering into my ear ‘You can do this, take it one step at a time. Remember success is dedication’. I smile in response and remind myself to go about the tasks ahead in a happy and loyal manner. I reach the bottom of the stairs and proceed to complete task 1. Task 1 complete, I tune the radio to a half decent station and sit at the kitchen table (lately this is where I seem to be more productive). Notepad in front of me and Berol® pens to my left, I sit staring out of the kitchen window whilst deliberating what is involved in the whole research/ dissertation process. This may seem simple to some people but I am struggling. It is 2.30pm when I look at the clock and I haven’t written anything down on paper. Motor speaks out, ‘Come on! Stop deliberating and get writing. Just write down every tiny aspect that comes to mind. You need to stop making this hard for yourself. It does not have to be this difficult. Remember: writing something is better than nothing and the outcome of this task does not have to be set in stone. You can do this! Go on, give it a try!’ In hearing this I feel encouraged; in response I grab a pen, open my notepad to a blank page and begin to write. By 3:30pm I have written down a set of task that need to be completed. These are the overview tasks to which I will add the smaller, finer details to later. 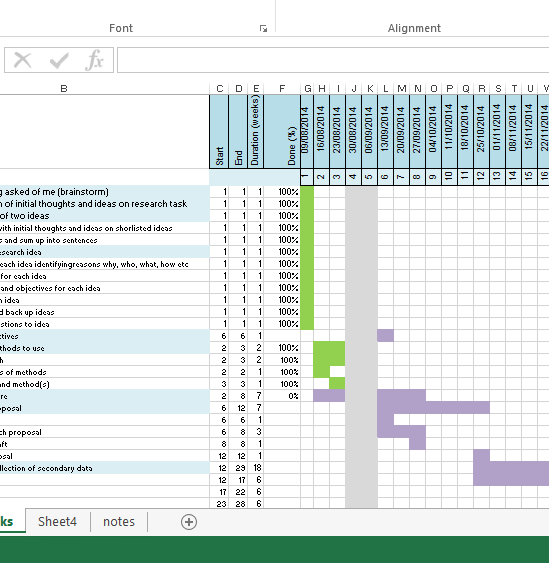 Now I must go onto task 3: creating a Gantt chart. This is going to be challenging as I have no idea how to use conditional formatting in excel. I sit and think about how to go about this challenge for 10 minutes. I open an excel sheet and play about with it but this leads to the deterioration of my motivation. I stop and take a break. It is 5pm, I have not yet imputed all the data into excel because I have been playing about with the programme. I must focus my attention to the task at hand. =IF(AND(H$4>=$D5, H$4<=$D5), “X”,””) & IF(AND($D5+$F5*$G5>H$4,H$4>=$D5,H$4<=$E5),”C”,IF(AND(H$4>=$D5,H$4<=$E5),””)). That was mind-boggling stuff, but at least I have my chart to help me along my dissertation journey. The only thing I need to work out is the time schedule for each activity to allow for the completion of the chart. I have added a ‘% complete’ column for each task to show me how much progress I am making. This will show up as a green bar and the chart will update automatically as I put in the % values. Sound confusing? It was and still is. My head hurts. When I finish my food (I made a cheesy, courgette omelette) I transport my laptop to the living room and return to my Gantt chart at 9.30pm. Opening the chart I look over what I have achieved so far. To prevent me becoming stressed and worried motor reminds me that this is only temporary; I can come back to make alterations. I continue by plotting preliminary timescales. Another hour passes and I have finally finished my temporary Gantt Sheet. I must admit I feel very pleased with it despite it taking me all day. I have set my year out over 38 weeks and I know what direction to take. When I re-enrol at University I will be able to update it to add in other assignment deadlines and meetings with my supervisor/academic support staff. I am looking forward to getting started with my research now. On reflection today has been successful, I have not yet achieved Task 4 and I do not think I will get this done tonight but that does not matter; I did say when I planned it into my schedule that it was to be done if I had the time left to do it. My laptop clock reads 10:47pm. I do not know if I should stop working or not. I contemplate this and come to the conclusion that I will read around research methodologies for the rest of the evening. I finish reading at midnight and make the move to my bedroom. Today has been mind-boggling and challenging; I may not have completed all the tasks set but it has been a success regardless. 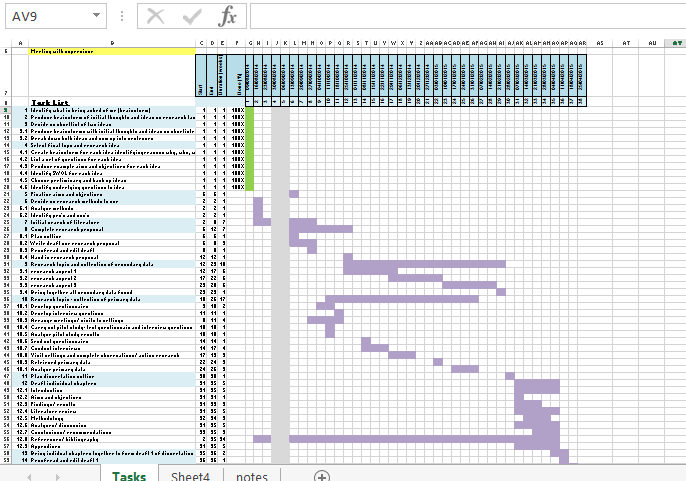 Gantt chart completed, my dissertation journey has a sense of direction.